The Now Hear Ensemble sets up for Ghost in the Machine. 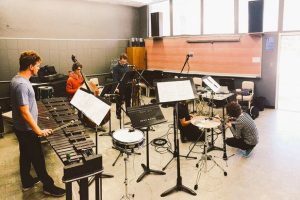 Recording available on the Now Hear Ensemble’s album Made in California. In Ghost in the Machine the ensemble is fused into a single robotic entity playing tightly interlocking patterns of percussive sounds. Transducers placed on percussion instruments are triggered by the performers and act as extensions of their instruments. Beneath all of these noisy rhythms, a slow, sustained harmonic progression is gradually revealed as the piece progresses.